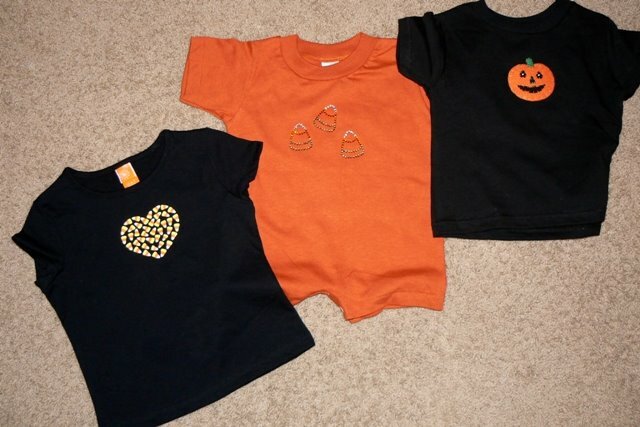 In all honesty, the black shirt on the left is from Target; it’s a candy corn heart. I got the orange romper for KB and added the sequin candy corns. The pumpkin is an iron on for Bubba. Add a couple orange hair bows and a pair of khaki pants and shazam! Talk about cute pumpkin patch pictures. . . Absolutely adorable. Much better than our pumpkin patch pictures where everyone dresses themselves and usually we even forget to comb hair.We’re all about keeping it real. Even the staged photos. *wink*Those outfits..way to go! No wonder you and I are friends! I know I have 2 of the 3 needed. Speaking of matching hair bows, Walmart had the cutest headband bows for Halloween. boutique cute for $3.50! your punkins are gonna look so cute! i’m so impressed. really. i’m so not kidding and wish you would give me the secret of how you found a 25-hour day because i don’t know how you do it. Love the shirts! You’re sooo resourceful! Can you email me the web address for the free backgrounds. Love yours and Anna’s! I’ve got to get on top of our blog page!